Successfully Added Pressure Washer For Car - 80W, 10m Water Hose, Light Weight, Portable, Different Cleaning Heads, 8L Per Minute to your Shopping Cart. With this portable pressure washer for car, you can be guaranteed that your vehicle always looks like new. This car wash pump kit comes with a convenient and durable storage box. Thanks to this, you’ll be able to easily store it in your garage or in your trunk without needing to worry about damaging it. Your high-pressure car washer furthermore features a lightweight design thanks to which it can be easily carried around. It is powered straight through your car’s cigarette output so you can literally use it wherever you are. From now on, you’ll always be able to impress the people around you with your shiny wheels. This car gadget comes with different add-ons which bring along a wide range of different cleaning methods. The high-pressure water gun produces a strong beam of water that is capable of removing the toughest dirt. Additionally, it also comes with a soft cleaning brush that is perfect for cleaning the windows of your car as well as the body itself. With its 10m water hose and 5m power cable, this pressure washer for car brings along great usability. It is capable of using up to 8L of water per minute; however, the strength of the water can be manually adjusted. Thanks to this, you’ll always have the right water pressure to meet your cleaning demands. With this cool car gadget at your side, you can be assured that your car will always shine brightly. 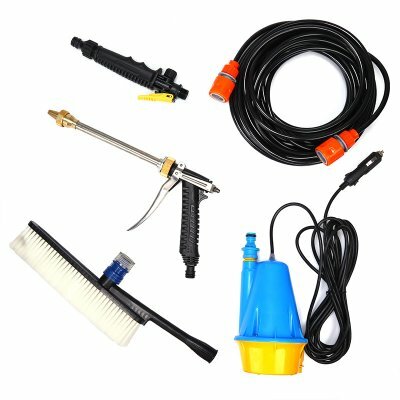 If you often hit the muddy back roads, this car wash pump kit is perfect for you. It offers you all the means necessary to thoroughly clean the outside of your car in a fast and efficient manner. The different accessories and lightweight design make this pressure cleaner easy to handle for anybody out there. No matter where you’re at, from now on you can always enjoy a clean car that looks as if it just came out of the factory. This car pressure washer comes with a 12 months warranty, brought to you by the leader in electronic devices as well as wholesale electronic gadgets..